LATAM Airlines Group during 2Q2013 marked the first anniversary of its landmark merger between South America’s largest airline groups LAN and TAM with an overall loss of USD300 million for the historically weaker quarter, which also reflects the continuing struggles LATAM faces in the depreciation of the BRL against the USD. But against those challenges LATAM has seen improvement in its domestic Brazilian operations as unit revenues in those markets grew 14% mainly driven by load factor growth. Unlike Brazil’s second largest carrier Gol, LATAM’s scale is providing opportunities for the company to reduce its exposure to currency fluctuations, decrease its capital commitments and realign its fleet in certain operations to improve unit costs. All those initiatives allow LATAM’s management to remain confident that all the reasons behind their tie-up remain sound, and the underlying potential to deliver long-term financial benefits remains intact. Some of the bullishness LATAM’s management holds with respect to the long-term benefits of the merger remaining intact was reflected in the company recording USD233 million in merger synergies in the 12 months since their merger was finalised (along with USD103 million in one-time costs). Currency fluctuations also pressured LATAM’s top-line passenger revenues, which fell 1.4% to USD2.5 billion and a 3% decline in overall yields. But expenses also decreased almost 5% to USD3 billion and unit costs excluding fuel fell 3.1%. The decline in expenses helped improve the company’s operating income year-over-year to positive USD39 million. LAN and TAM closed their deal during a period of macroeconomic sluggishness in Brazil – Latin America’s largest economy – that has not abated during the last year. Both TAM and rival Gol have made highly publicised capacity reductions, while TAM has honed in its revenue management of different passenger segments in Brazil to improve LATAM’s overall performance in the Brazilian domestic market, which during 2Q2013 accounted for 34% of the company’s passenger capacity. The company’s passenger capacity in the Brazilian domestic market fell 11% during 2Q2013 while load factors increased 9ppt to 78%. Its unit revenues in those markets increased 14% in Brazilian currency (which is lower in the USD comparison), but given the overall 3% decline in LATAM’s total passenger yields, presently the company appears to be trading in loads for yields in the Brazilian domestic market. LATAM’s main domestic rival Gol appears to be operating under a different set of dynamics, as its yields improved 13% year-on-year during 2Q2013 while unit revenues grew almost 8%. But load factors fell 1.8ppt to 68%, 1ppt below Gol’s estimated break-even load factor of 69%. During a recent earnings discussion with analysts, LATAM executives remarked that they expect unit revenues in the Brazilian domestic market to rise 14% to 15% during 2H2013, and indicated that going forward during that time the company would focus on improving yields to fuel the growth in unit revenues. The 5.3% depreciation of the BRL against the USD during 2Q2013 resulted in a USD361 million foreign exchange loss for the quarter, which helped contribute to the overall loss recorded by LATAM for the three month period. During the past year since the merger completion, LATAM’s management has taken steps to reduce the company’s exposure to currency fluctuations, given that 35% of the company’s revenues are denominated in BRL and 25% of its costs all fall under the Brazilian currency. In addition to its focus on increased sales in USD in Brazil while increasing costs pegged to the BRL, LATAM is also attempting to mitigate the negative effects of Brazil’s currency depreciation by moving TAM aircraft and related debt to LATAM balance sheet, which is pegged to the US currency. The company estimates since Jun-2012 the exposure of the BRL on TAM’s balance sheet has been cut from USD4 billion to USD2.4 billion, with a further USD0.9 billion reduction by YE2013 and close to zero exposure by Jun-2014. While Gol has the ability to hedge against currency fluctuations, it does not have the manoeuvrability to move assets around into different monetary denominations, which means it will continue to battle pressures associated with depreciations of the BRL. During 2Q2013, roughly 56% of Gol’s expenses were denominated in the USD. In addition to capacity containment and reductions in the Brazilian domestic market, LATAM is also rationalising capacity in its international markets. It expects a 10% reduction in international ASKs year-on-year during Dec-2013, and overall international ASK growth for 2013 of 2% to 4%. LATAM is reducing long-haul flights from Rio de Janeiro to Europe as it consolidates Brazilian long-haul service at Sao Paulo Guarulhos, which entails the grounding and sale of the 10 oldest Airbus A330s (featuring 235 seats) operated by TAM and replacing those widebodies with LAN’s 221-seat Boeing 767s, which also feature lie-flat seats in business class. LATAM executives are replacing the older widebodies with aircraft that have a lower unit costs. As of Jun-2013 three of the 10 aircraft pegged for grounding have been cut from the company’s operations. The ability of LATAM to rid the joint fleet of aircraft that have both an inferior product and are more costly to operate is a key benefit stemming from their merger, giving the combined company an ability to optimise its fleet and place better performing aircraft on long-haul routes. It appears a large portion of LATAM’s energy at the moment is being dedicated to rationalising all of its Brazilian operations even though the company during 2012 made a push from Lima to capitalise on better performing south-north markets to North America. Going forward another focus for LATAM in the international spectrum is the recently-inaugurated codeshare with American Airlines resulting from the decision by the company to stick with the oneworld alliance. As a result TAM (which is exiting Star in mid-2014) had forged a codeshare with American that will better leverage its flights from Brazil to its US destinations of Miami and New York (both American hubs) and Orlando versus the Houston and Chicago hubs of its Star partner United (not served by TAM). The American codeshare supplies better connectivity, giving TAM’s passengers access to 50 additional US destinations. LATAM is making further fleet adjustments outside the grounding and eventual sale of 10 A330s by reducing its delivery commitments by 22 aircraft (21 narrowbody jets and a single widebody) between 2013 and 2015, which will result in a USD1.1 billion reduction in fleet commitments compared to Jun-2012. The carrier remarked that now its orders for that two-year period are concentrated on the higher density A321 narrowbodies and new Boeing 787 widebodies, which indicates the deferrals are centred on the A320s. CAPA’s fleet database indicates LATAM has three A319s and 40 A320s on order. It also has 47 A320neos on order, but first delivery by Airbus of the re-engined aircraft is not scheduled until 2016. LATAM executives estimated the company presently operates more than 50 A319s and the expectation going forward is to increase the average size of the company’s narrowbody aircraft. During 2014, LATAM plans to increase the number of A321s in the Brazilian domestic market followed by upgauging in Spanish-speaking countries in 2015. Executives remarked that they believe operating the higher-density A321s would reduce its unit cost per ASK by 20% by replacing A319s with A321s. Factoring in the latest adjustments, LATAM’ year-end fleet totals for 2013, 2014 and 2015 are 327, 317, and 334, respectively. 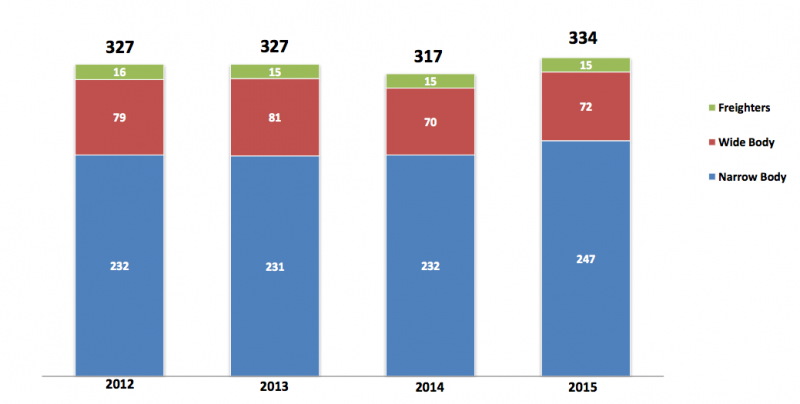 That compares with previous projections of a year-end total of 335 aircraft for 2013 and 359 for 2014. Prior to LATAM’s efforts to shed USD1.1 billion tied to aircraft on order, the company had USD6.1 billion tied to aircraft acquisitions during the next three years. 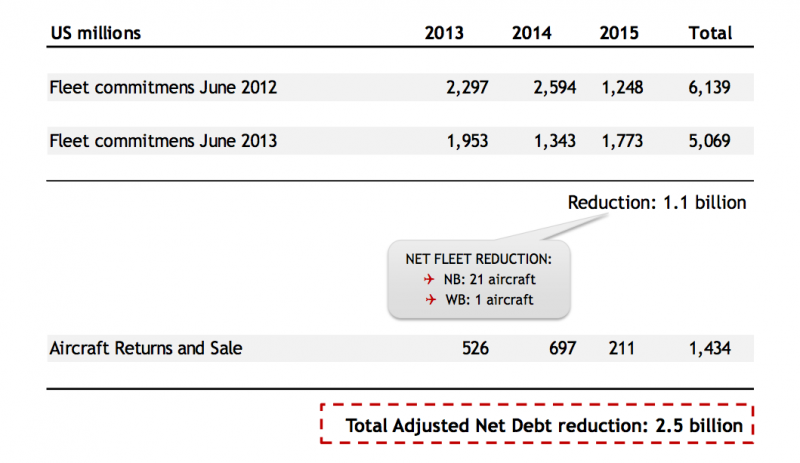 The deferrals of delivery combined with the shedding of TAM’s older A330s should reduce LATAM’s net debt by USD2.5 billion compared its net debt level as of Jun-2012. LATAM’s adjusted net debt as of Jun-2013 was about USD12 billion, and its adjusted net debt ratio to the last 12 months of EBITAR was roughly 6.5. Company executives remarked that it aims to lower those ratios back to 3.5 to 4 in about three years, which could be coupled with an equity offering around that same time period. Despite some of the leverage pressure and short-term earnings challenges that have resulted in LAN’s merger with TAM, the company’s executives remain steadfast in their belief that it can return to investment grade metrics and stress the “this it not a TAM problem” as the rationale behind the merger and its value are exactly the same. Declarations of goals and executing on those aims are two very different scenarios. While LATAM remains the powerhouse in Latin America, it will continue to face pressure in its Brazilian operations for the short term. But an ability to leverage the scale not available to each individual entity prior to the merger is an acute advantage, and it seems as if management is making all the right moves to deflate the pressure from macroeconomic conditions. Obviously three years in the airline business can be a lifetime, but if LATAM meets its de-leveraging goals, the company will go a long way in proving the worth of its merger.